I grew up hearing about Webb's City in St. Petersburg, but I never had a chance to visit that famed shopper's paradise. The so-called "World's Most Unusual Drug Store" had already closed in 1979. 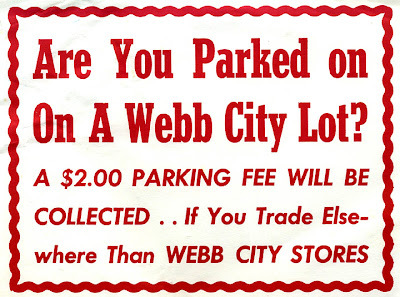 But during its heyday, Webb's City was renowned (and attacked) for its "stack it high and sell it cheap" philosophy and its fearlessly tacky gimmicks that included dancing chickens, mermaids, and dollar bill-sales (95 cents per buck). Webb's City was a southern tradition. Launched as a cut-rate drug store in 1925, Webb's City grew fast during the Depression thanks to "Doc" Webb's willingness to do anything to attract customers. He was particularly beloved for his two-cent breakfasts in those early days, when anyone who could scrounge up some pennies got an egg, a bacon strip, and a side of buttered toast, along with a cup of coffee and a glass of orange juice. Thus fortified, anyone could go shopping at Webb's. Webb fashioned himself as a man of the little people, selling goods below prices set by their producers and fighting lawsuits that challenged his cut-rate tactics. In St. Petersburg and the Florida Dream: 1888-1950, Raymond Arsenault quotes Webb's philosophy, "I don't care a damn about money . . . I wanted customers." At its zenith, Webb's City included 77 stores covering seven city blocks, selling groceries, hardware, surgical supplies, electronics, clothes and, of course, drugs. Webb's City offered a combination of history, hucksterism, and value that can only now be experienced, I suppose, in South Dakota's Wall Drug. I'd love to learn more about Webb's City, so if you ever visited "Doc" Webb's beloved xanadu of values, please leave a comment. Webb's City cafeteria was a mainstay of our family's diet on Wednesday nights, when a chicken pot pie in a ceramic bowl, vegetable or salad, beverage, and dessert was 39 cents late "40s to mid/late '50s. Bob, thanks for your willingness to share your recollections of Webb's! I grew up in St Pete and remember going to Webb's grocery store on Saturday mornings with Mom. If we were good, we were treated to what seemed like to me GIANT soft ice cream cones. I also remember the mermaid show and how sometimes they would talk to you even though they were obviously not "live". I liked the ship sailing in the background the best. I also enjoyed the dancing chickens and bunnies. When we were a little "older" (say 10 or 11!) my brother and I were allowed to take the city bus downtown together to go to Webb's. What a time! I am glad I lived in a town in a time when kids had such safe freedom. Today's kids are gypped despite all the new fangled electronics. Give me a Saturday in old downtown St. Pete any day! Thanks for allowing the fond recollections! Thanks so much for your willingness to share your memories! Ohhh...The memory of my visit to Webb's City. Our family was visiting relatives that owned a now, also, defunct beachside motel on St Petersburg Beach, FL. Dad decided we all take an excursion to Webb's City. There, he bought the one and ONLY bikini swimsuit that I ever wore in my life. Of course we toured all the stores and had to view the "Mermaids". Thanks for sharing your recollections. St Pete was my early childhood home. 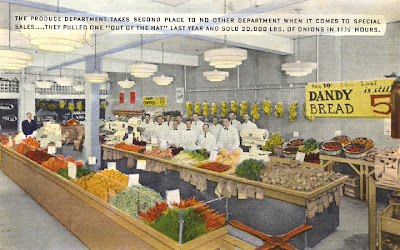 My father worked at Webb's, in the produce department. I recall that the fourth floor was where the toys were... and that on one occasion, a curious child pushed a button on the escalators and shut them down, lol! I got in trouble for that one! It was one of the first 'everything' store. It just happened that old Doc Webb started it all as a drug store. webbs its great to hear everyone remembering the past. I was born in 1952 and grew up in St Petersburg. Webb's City was the place to go on Saturday. We had tough times in the 60's when my dad got sick, Doc Webb gave my mom a hand written note telling his cashiers to take 10% off our groceries. He was a good man that cared for his customers. It's sad to think about what happened to downtown St Petersburg, and even sadder remembering when the city tore down the main Webb's building. Thanks, Ed. I appreciate your sharing of memories! Sad to hear that they pulled the place down. And that the college changed its name. We spent many vacations in the St. Petersburg area, Treasure Island, Clearwater... with fondness I remember Webb;s City. Mostly the ice cream, the mermaids, and the chicken, rabbits and pinball baseball games. It is a true shame that Webb;s gave way to malls and other sanitized experiences. I would like to hear from anyone who remembers other area attractions like the Aquatarium, Madam Tussauds, Six Gun Territory (Ocala)...Some of the happiest memories of my childhood were from St. Pete. I am Troy Webb 4th child of James Earl Webb Jr. Doc Webb's son. J.E Doc Webb was my grandfather. I was moved to write some of my memoirs after reading these stories. I was 10 years old and living life large at the height of Webb’s City popularity. Where do you begin when you grew up in a three ring circus? My Father and Grandfather where marketing genius. I enjoyed listing to their stories about how to bet out the local Publix. I went shopping with my dad 5 times a week at Publix but we never bought more than a piece of gum. I always wonder why. My first career move was working at Webb’s City loading chickens into the bins on 5 cent chicken day. That was crazy fun because I would load only 5 or 10 chickens into the bids with 30 ladies waiting to grab them up. Craziness would breakout and I laugh until I tuned red until one day I got a tap on the shoulder and it was my dad, the laughing stop. Ouch! I was relieved of my duties as a chicken loading expert and move on to the Watermelon patch where I could cause no harm. My career continues and at age 12 I was pumping gas at the Webb’s City Trading Post for 17 cents a gallon. Some days the cars would line up ½ a mile long. Doc would stop by to get gas in his very large 1967 Lincoln (which was raffled of every year to some lucky shopper). He would stay “Troy Boy” on your way in did you notice any other gas station with prices lower than mine. I would say yes once in a while just to see him get after my Dad to see where and who could sell gas lower that Doc! I then thought I need to move on to a bigger and better career than pumping gas with 75 year old gas jockeys. Now at 14 years old I was a tire selling guru in the auto parts department! Now who’s the man! I quickly found out that Doc had the same stack’em high sell’em low mentality and it simple worked. I sold more Copper tires than Carter had pills. That was not the job for me. More later if Andrew will let me continue..
with the entire text of what you have in mind - I'll set up a post that will be dedicated to your contribution as a guest-blogger. Also, if you have any pics you'd like me to add to that post - which I can't do in a "comments section" - let me know! WOW! What memories! I worked in the delicatessen in '49 and '50 right across from the barber shop and the Coke counter. Never saw so many bottles of Coke in one place! I remember the "medicine" shows in the parking lot - Charles Antell and his lanolin stuff for the hair, the Indian "chief" who was an ace with the bow and arrow, etc. etc. Incidentally, the mermaids were live. Then there were Doc's girls, the models, I used to give one of them a ride to work! In 1962 when I came back to St. Pete to work at Honeywell I met a man who used to be asst. Manager of deli, now manager of supermarket who offered me a job. I told Doc's sister Alene (my mother-in-law's best friend) and she said "You know us, honey, we don't pay nothin'" Doc never gave us discounts - he'd already cut the price as far as he could, but we were treated like we were friends. 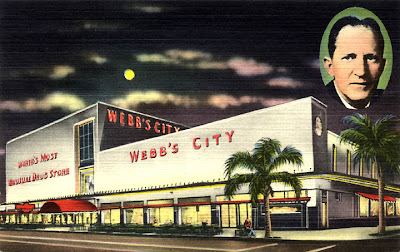 Webb's City was the most unique shopping destination that ever existed in the South. It was like Walmart on steroids, long before anyone ever heard of Walmart, and much more. I grew up in St. Pete during the 60s. What a time. Whenever my mom said we were going to Webb's City, I was the first in the car. As a kid of 6 in 1964, I could get lost for hours in that place. I loved the doughnut shop where I could watch the doughnuts being made. I fondly remember the magazine rack in the pharmacy. I used to plant myself there and read all the comic books I could. At the lunch counter on the fourth floor, you could get a great tasting hamburger real cheap, and watch a chicken peck a ping pong ball, suspended in air by an air pump, into a basket for feed. I remember, back in 1964 I think, they brought the Aston Martin that James Bond used in Goldfinger to the store and parked it outside the entrance by the barbershop. It was awesome to look at. I wonder where it is today. The main building had four stories and included a clothing department, a furniture/appliance department (a bigger one was built next door), a grocery and, of course, a pharmacy. And the large gas station next door had a large bait and tackle shop where you could go over and see live bait in a large tank. Pure fun for a small kid. The store's closing left a void in downtown that is felt to this day. From Atlanta. Of all the posts on this blog, "Searching for Webb's City" has generated the most response! I so enjoy reading y'all's recollections. Troy Webb, I seem to recall you changing radio station preset buttons on a T-Bird in for an oil change at Webb's Auto Center.. LOL! Man that was a long time ago, think i was around 15yo back then before i started driving, I hung around the auto center after school some times. Doc Webb's Special gasoline 19.9 and it drew a line around the block onto 1st ave south. Soft water laundry had to hire a guy to keep the cars in line from blocking their driveway.. I'm 57 now but can remember Webb's City like it was yesterday. Andrew, thanks for providing the blog and photos. Hi! I am Tiffany Treadwell Lettelleir, my mother is Sherry Webb Treadwell, "Doc" was my Great Grandfather. My memory of "Doc" was when he gave me a handful of candy everytime I visited him. I love reading all of your comments and memories of Webb's City. Its makes you want to cry to go back to the good days when Webb's City was the talk of the town. Walmart couldn't touch Webb's City. My grandparents brought me to Webb's in the late 1960s. What a crazy place. The trained animals were great; I recall a rabbit that would kiss a plastic bunny until it "blushed". There were other small animals that did tricks like walking a tightrope, putting out a "fire", and dancing. I wanted to talk to the mermaid everyday, never did see the clerk who was the mermaid voice. Webb City was my first employer. I graduated from High School in Indianapolis 1965 and my graduation gift was to spend the summer with my aunt and uncle in St. Pete. I got a job bagging groceries at Webb City. I have good memories of the group of kids I met there. It was a hugh place, very unique. I lived in St. Pete for 3 years in the early '70s. My mother worked at the lunch counter in Webb's City for a short time and my father worked there briefly as a cook. I remember the small soft serve cones for 9 cents, the very large cones for 19 cents, the donuts for some ridiculous price like 19 cents a dozen, the haircuts which were very low priced (and looked it!) Yes I remember the chicken who would perform a dance or a trick for a little food inside a machine and I believe it would release a plastic egg with a little toy inside(?) Also the lame mermaid show! I was about 10 years old when I saw it. I remember watching it, telling my siblings it was just a recording, a fake, when the mermaid said something like, "We're not fake, little boy, we're real." How embarrassed was I? A very interesting place. Even by that time, the neighborhood was on the decline, not the safest place at night. But I have visited St. Pete last year and the 2 years previously and I have to say I still like this town. number on the back of it and dropped it into some receptacle that was set up for that purpose. at Webb's City, maybe at another time. I was born (1964) and raised in St. Pete. moved away in 1978. Webb's City was the best! I remember going there as a kid with my Mom. She would grocery shop and the cereal isle was amazing, the meat dept had a stool in the far left corner that I would sit on and watch the butchers and ask for a sample of bologna and of coarse they would give me one. The animal acts were cool, I remember them well, the dancing chickens etc. The elevators had a colored woman as an operator,but that took the fun as a kid at getting to push the buttons and play. I got my hair cut in the barber shop, and the donuts were "the best"! I have so many fond memories of Webb City, it was a treat and an experience to go there as a child. I loved that place. The Mermaid show was most of the time closed as I remember, and when I did finally see it I was disappointed as it was not real. But oh well it was off to the toy section where I could get lost for hours! I was very young at the time so I don't remember the cost of items or services, all I remember is that it was such a cool place with such a variaty of products and attractions. My childhood growing up in St. Pete on the old north east side near coffee pot blvd. were the best times of my life, and memories that I will cherish forever! Thank you Doc Webb for providing my parents with such a good store and great prices and for me as a kid to be enthralled with the spectacle that you provided young imaginations. Chuck Rice - proud native of St. Pete Fl. 4 and a half feet tall, attractive in their 24th or 25th years of age. tourist attraction way out on Forth Street North. When you drove out a bit further where Gandy blvd. south sea open air was directly across the street from the front of the main store, forgot to mention that when describing it in the beginning of this writing. I also loved the hair cuts. For kid's would get a ticket for a free ice cream cone. I can remember mom going their once for a gas sale. (Now that's the good old days) In 1963 they had a sale and it was 19.9.
if I could convince them to sign up. youth in old St. pete, and Webb's. I loved this place as a young girl. My Grandparents lived in St. Pete and we went every summer for a visit from North Carolina. I remember the Mermaid Grotto on a upper floor...(can't remember which one) but I so looked forward to going into the little dark cave and looking through the holes in the rocks that let you see the beautiful mermaids and they even talked to you. I also loved looking for the sailing ship in the background....I also couldn't wait for the chocolate soft serve ice cream that was the best on the planet.I remember the ice cream shop being near the barber. I had forgotten about the dancing chicken until I read some of the post but this was also a highlight of the trip. I thought this was just a magical place and was so sad when it closed. I would love to see more pics. I have a deck of playing cards with a picture of Webb's lit up at night....beautiful! In 1967 I worked as a pharmacy "typist". There were usually about 4-6 pharmacists on duty there and a day shift and evening shift. A very busy place. There was a wall of prescription file cabinets. At that time paregoric and terpin hydrate with codiene were sold only on signing out for them and could only be purchased 3 oz. every 7 days or so. On Friday and Saturday evenings, many people who were addicted to these would line up and sign the book. we would have to go back through the book to make sure the writing was'nt the same within the legal time period. I remember the shows upstairs, the ice cream, the bargins. It was a very interesting place. One of the pharmacists became my first husband ! There used to be a pharmacist there who was a very good violinist and on his breaks he would step into the back room of the pharmacy and play incredible "gypsy" music ! The whole experience was a real show! I miss downtown and St. Pete in those days. Thanks for posting! I grew up in St Pete and we went to Webb's City too many time to count. I remember all of the things everyone else does, including those drinking fountains someone else mentioned. Back then that was just the way things were every where in the south. When I was 8 I learned a very valuable life lesson because of those fountains. Having just learned to read I decided that since I had always had white water to drink, I was going to have the "colored" water that time. Needless to say, there were some very upset people, and one very disappointed child. I was so sure that water was going to be rainbow colored, and instead it was plain old white water, still makes me mad, after all isn't that false advertising? In the car on the way home my Dad just told me that the water is the same but some people are different. Even then I knew he was talking about the ones that were upset, not the ones that were supposed to drink the colored water. I was raised in St. Petersburg and Doc Webbs and his granddaughter Sherry were a part of my life. In my later teenage years along with going to NEHI I worked at Neal's restaurant and Nichols brothers Rambler just down the street from Webb City. Reading all the comments has been good for me and I remember all of the places mentioned in the blog. Every Friday I would get off work early and go to get a haircut, double ice crime cone and feed the chicken. 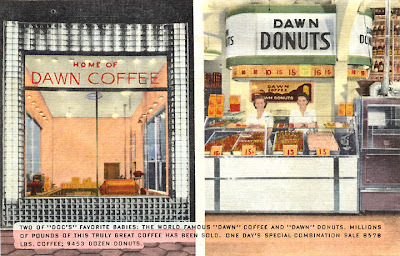 Yes I remember the escalator, the long lines at the gas pumps and the donuts yum yum. Docs family was special to me I remember every Halloween we would catch the bus just to get a chance to go to his house I believe near allendale. Thanks to everyone for the I comments I really enjoyed them. I was born in 1952 in St Pete and still on occasion even though I've lived in the West for 38 years I have dreams where I'm riding the escalator at Webb's City looking for someone or trying to get to a certain department. It was huge!! What an amazing place! I remember the Roper's (earlier post) also, we went to school with their daughter. I mostly saw Mr. and Mrs. Roper at Munch's like half of everybody else and their family that I knew. I don't know how Webb's would or could fare today but I can't imagine the St. Pete I grew up in with out it. My Mom is still the thriftiest grocery shopper I know but back in the 60's, she knew when and where to hit all the sales. Thursday evening, I seem to recall, was the night Dad would drive us to Webb's for Mom to shop. He would drop her off at the door then drive all around for a parking place. Everyone in town had the same idea because men in elevated towers throughout the parking lots would announce available spots through their microphones. Weren't they wearing pith helmets? What an adventure it was for little kids. I also remember that Doc's house in Allendale was THE place to drive by to see Christmas lights. Troy, after doing some research I came across this! I’m trying to find validity in J.E. Webb Sr bldg a house for his mother. I think my friend is now in that house, via her mother, and she heard that rumor! Feel free to email me if you receive this! Thank you so much!